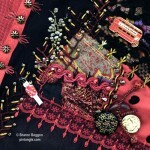 This hand embroidered seam detail on block 80 of my I dropped the button Box Crazy Quilt. Crazy Quilt detail 528 is of some hand dyed red lace. since it was set against a black background I did not need to do too much with it. using a rayon thread I attached the lace with detached chain stitch, oyster chain stitch and straight stitches. The Palace guard charm was a little item I collected on a trip to London. It balances the charm of the london bus which is in the top right hand corner of the block. 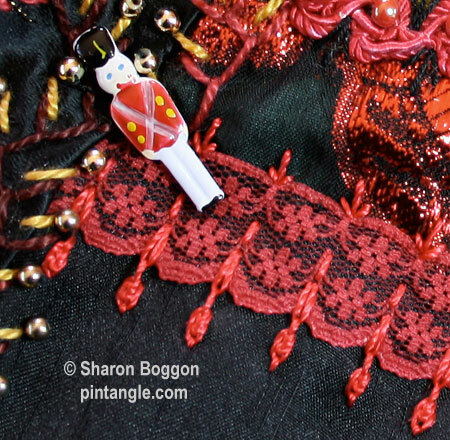 This article is part of a series that highlight the hand embroidered seams and Crazy Quilt details on the quilt blocks that make up my crazy quilt I dropped the button box. For a free pattern of the block visit the web page about block 80. Each block on this quilt has a free pattern which are listed on the CQ details FAQ page. Subscribe to my newsletter of stitching goodies! Working with red thread on the red lace and against the dark background you have made the lace even more ‘lacy’. Good choice of stylish stitches.